WARNING: Any resemblance between the walking foot in this diagram and the one that you are holding in your hand is purely coincidental. Small but crucial parts have been omitted from the illustration, so that you will feel like banging your head against a wall. Yes? Well, go put an icepack on your head and relax. Today's entry is from me to you with love. (Its also intended to replace a well-visited link to some very faded old instructions I scanned and uploaded ages ago). 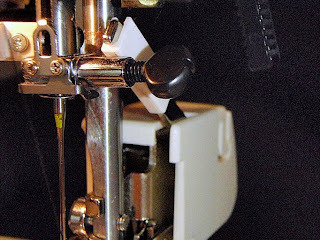 Press the red button on the foot attachment to release the existing presser foot. Put the foot to one side. Put the little set screw somewhere safe! You will need it again in a minute. Take the walking foot and raise the lever. Keep the lever raised and hook the walking foot around the presser bar. Line the foot up vertically, so that you can insert the set screw. Put the set screw in and tighten with the screwdriver. Make sure the walking foot is nice and sturdy. The lever should be resting on top of the needle clamp. Hooray! The walking foot is ready to use. Now a word of encouragement: the more practice you get at attaching and removing the foot the better. It can be a bit fiddly to start with, but the process does become easier ( ... and I speak from the point of view of a hopeless butter-fingers). 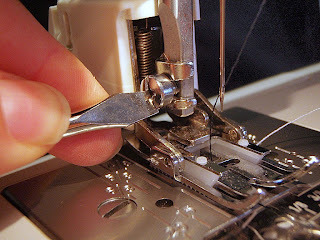 Whilst its awfully tempting to put the foot on and then leave it there, be aware there are some types of sewing that really shouldn't be done with a walking foot! If you wish to attach the quilting guide, you simply push it into the slot at the back and move it left or right to set the desired width. Thanks so much! I just ordered a Walking Foot for my Janome two days ago and hope, your instructions will make it easier for me. But I have one question: Do you have the needleposition up or low while attaching the Walking Foot? Frau Traumberg, I think you might be seeing my laziness in the photos. The needle should probably be up a bit more than it is .... but then I still managed to put the foot on without doing any damage! Enjoy your new walking foot when it arrives. They really are brilliant. Thinking perhaps that my 24yr old Jones machine will do a bit longer. It may be noisy, temperamental, and in serious need of servicing,(or maybe just cleaning) but I know how to change it's feet. Laziness! Pah! Installing while making a documentary about installing isn't lazy! After your How-to I'm waiting more impatiently then before! I always forget that bit where the lever rests on top of the needle clamp.... and then wonder why it doesn't work! The first time I ever got out my walking foot to try to use it I remember looking at it wondering what the hell was I supposed to do with it. It took a lot of trial and error but I finally figured it out. Man I wish your tutorial had been around a few years ago! It is great. One thing I have found when you use it continuously (i do when i sew) is that you need to remember to tighten the screw every so often. I bought a walking foot about a year ago! And have NEVER used it because I couldn't figure out how to install the darn thing! Thanks so much for the detailed tutorial. The photos were key. I think I might try it out tomorrow. I want to make my first quilt for my little girl who is going to be ready for a big girl bed soon. I am searching the internet now for my first walking foot and it's for a Janome. I came across your blog. Thanks for the info. Ok, I'll come right out and say it...I love you! Thank you so much for putting this on your blog. Your directions were right on and five minutes later I was machine quilting my first quilt! Thank you again. thanks heaps,i was lost, had no idea how to attach that thing to my sewing machine. So glad i found yr blog. Thank you so much for this. Having invested a not inconsiderable sum on my new walking foot I was about to throw it out of the window. Searched my handbook and janome website and nothing to help me. You are a star. It's incredible that such a contraption should come with such little instruction, tips or advice! 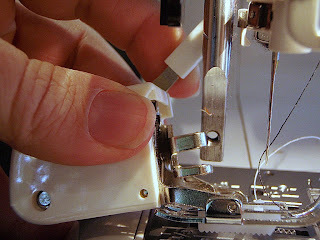 I just yesterday bought a Janome walking foot, couldn't attach it, found your blog (yay!) attached it and just finished quilting my first ever quilt. Thanks for taking the time to create this tutorial. So pleased to find your instructions. Just what I needed and I thought I was the only one with this problem! You didn't mention dropping the feed dogs on the machine. Is this necessary when using this foot? Looking forward to your reply. Thanks. Nellie, glad you found this useful! You definitely need to keep the feed dogs up on your machine. The even feeding comes from having an upper and lower set of feed dogs (in the foot and your machine). Thanks again Liesl for clearing up my confusion, now I can hopefully get on and finish last years quilt! Oh thank you thank you thank you. I just bought a foot and was about to consign it to the heap of unuseable gadjets till i saw this post. I am forever grateful for these instructions! Thank you for taking the time to help the rest of us. I bought my walking foot a couple of weeks ago and the salesman even showed me how to attache it. Well, I still had to find a video...couldn't remember what he had done, he did it so quick. Thank you, thank you. You and Google kept me going. Thank you so much for posting this! Just borrowed a friend's walking foot and was staring disaster in the fce until I found this! Just curious...what type of sewing shouldn't be done with the walking foot attached? I reiterate what the others above have said about the walking foot. 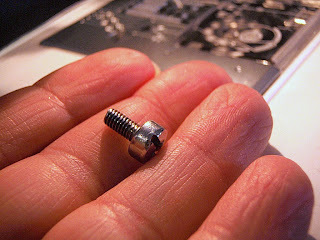 I 'thought' I should install it in the manner you describe because my old machine operated that way when changing to older feet, but the screw on the shank was so tight I had just about decided that it was not meant to be turned! I really needed some muscle to loosen it. Thank you for your post....I have had a walking foot forever and always looked at it and my machine with total confusion and put it away in total disapointment. I am thrilled to get to use it tonight!!! Thanks so much! God bless you. And god bless the internet. You have saved my life tonight. Many thanks! like many others who have commented, i was surprised that my walking foot came with no instructions. thanks very much for sharing this step by step photo tutorial!!! Like the previous posters, I got home yesterday with this fantistic (??) new foot. Quilted all night in my sleep, got up this morning, started to install it and sat there in complete bewilderment. Why doesn't Janome get their act together and realize that not all of us are experienced users. Thank you, thank you, thank you!! I found your web page and am anxious to tackle the job again. Thank you for posting such a fabulous tutorial! There would have been no way I would have figured this out from that one ridiculous sketch on the back of the packaging. Thank you, thank you, thank you! You are saving my day with this post! Thank you for writing this tutorial with humor, you had me laughing with the "(Don't let your three-year-old play with it or you're a goner..."
Thank you for the tutorial! I was able to get it on my machine but I'm having trouble with the needle. When I sew for longer than two inches, the screw that keeps the needle in place comes loose and my needle pops out. Am I doing something wrong? Thank you! Hmmm The Hunter's Prize, I am not sure why the needle would be popping out. The walking foot does seem to vibrate a bit. 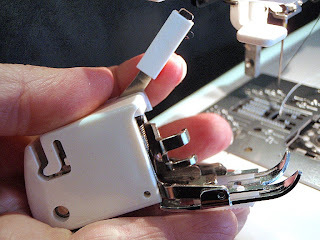 I have noticed I have to re-tighten the screw that holds the foot on every now and then. Maybe the thread on the pin might be worn and is coming loose with the vibrations? Can you take it to a sewing machine dealer/repairer to get it checked? I'll add my thanks to your (long) list... I'm another who bought a walking foot and received ZERO instructions with it. a quick google brought me this post and I'm off and sewing quicker than if I'd tried to call the store and have them explain it to me. You're an angel for posting this! Thank you SO much! I got the walking foot for my bday on the 6th and finally, today, I had a chance to use it! Without your tutorial, I'm not sure I could have figured out to attached it! wow, wish I found this a couple of years ago when I needed that icepack on my head trying to figure this out! My walking foot is a little noisy, makes a loud "clinking" noise with every stitch even though it sews beautifully. Do you think this is normal or is yours as quiet as using a regular foot? You're my saviour! My new Janome walking foot arrived in the post today with NO instructions whatsoever! Not even a scant instruction or dodgy diagram! Just a foot in a plastic bag. Thank heavens I found your fantastic post BEFORE I spent hours puzzling over it (and banging my head on the wall). THANK YOU!!!! Thank you!!! I gave up trying to install mine PROPERLY a while ago (don't think I did damage to my lovely machine). I'm keeping these directions in a good place. Thanks so much for these instructions - I bought a walking foot today for my two quilt projects and was bamboozled about how to attach it! All attached and working fine now. Thanks so much, I was completely in the dark when this arrived in the post and a baby quilt to complete by Friday! No pressure then - I've just fitted this following your instructions and it all looks fab! Thanks again. Thanks heaps for this wonderful post - you made it so much easier! Thank you for your excellent directions and pictures. You saved my day! I have a Janome MC4800QC machine. It came with a Basting foot (P)..it is plastic with an oval bottom with a hole in it. I want to do free motion quilting, do you know if I can use it? I don't see any reference to using it in the manual. Thank you. I just got my walking foot today and have been trying to figure it out for the past 30 mins. until I decided to Google it to see if anyone had the instructions....now I can go take the 'icepack' off my head. Today was my first attempt to use my walking foot. Above post made mention of needle falling out - mine did as well. The second time ruined the needle, so I knew I did something wrong found this site and sure enough I did not have the lever on top of the needle clamp! Now all is well. Thank you. Thank you. Just purchased a new Janome and there are NO instructions on how to attach or use this foot. Thank goodness for the internet and those who are more experienced and are willing to help others. I have printed these instructions out for the next time that I decided I will use this foot on my machine. This is brilliant! I have popped you a private message to ask if you'd be happy for this to appear as a link on my blog or as a guest blogger post as I've been doing a series on machine feet lately and this would fit brilliantly. Thanks - wish I'd looked last week took mine back to the sewing machine shop and managed to work it out between us but it was very awkward. Will keep a copy with my instruction book for future reference. I'm new to all this including my new Janome 7330 machine (or any machine). Thank you for any help you can give. 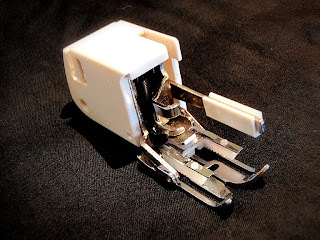 I just received my walking foot yesterday for my Kenmore sewing machine. It is made by Janome and looks exactly like yours does. Thank you for the instructions and pictures. I am happy to have found your blog. I'm having trouble figuring out how to attach the quilting bar. It doesn't seem to fit anywhere snugly and if I try to put it in the slot there in the back, it's loose. Is it supposed to snap in there somehow? I'm afraid I'm going to break the walking foot since it is plastic in that areaa and don't want to force anything. Please help. Thank you. Hi Christel. I use my walking foot for dressmaking rather than quilting so haven't made use of the bar. I just found this short video on the Janome site. The voiceover says something vague like "slide the bar in", but shows the demonstrator using two hands to encourage the bar down the angled part of the slot. Take a look and see what you think. Good luck! Thank you Liesl - I couldn't figure out how the bar even went - but the video made it easy. This is great!!! Thanks again! Do you know how long I just scoured the internet for THESE EXACT INSTRUCTIONS?! thank you so much!!! I am so relieved I can use my walking foot now! 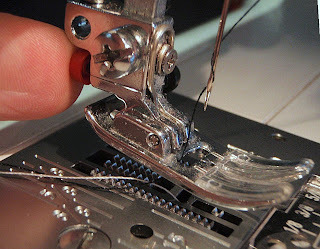 YES Janome makes terrific stuff but their instructions are sketchy at best, I am thankful to you for the instructions and for this blog! I had trouble with the quilting guide, though -- I thought I was doing it just right but the two little plastic holders (I guess that's what they are, they look like tiny boots) have broken. They still are on the foot housing but now they wiggle loosely. I think the foot will wtill work ok, but the guide is going to be useless now unless I can figure out a way to fix it. Thanks so much for this great post. I got my walking foot today, but had spent last night reading your instructions and felt like a pro when I cleverly got my foot on in one easy go! Woo hoo! I almost just took my walking foot back to the dealer because I thought my husband bought one that wouldn't fit my machine. Thank you for filling in the instructions Janome left out! Thank you so much for these instructions. I had it installed, except didn't have the lever in the right place, and the needle wouldn't lower. Now that the walking foot is installed correctly, it's working great. Thank you for these instructions - if it hadn't been for you, I would have sent the walking foot back as not fitting my machine! You saved me a lot of hassle. Thankyou! How frustrating is it to not get instructions with the walking foot - it's not exactly obvious how to do it! WOW! You just saved me! 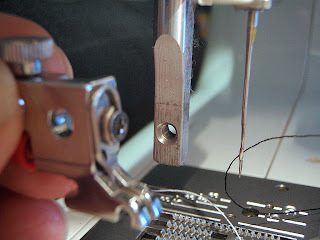 I couldn't figure out what I was doing wrong( Turns out, I didn't have the level raised when attaching so my Janome 2010 kept giving me an error message, "LO".) THANK YOU! I am so grateful to have found your blog with such wonderful instructions! Great instructions, thank you! Now I cannot get the foot to sew evenly while quilting! It jumps from tiny, tiny stitches to big ones and is pulling the top and bottom fabric terribly. Any ideas anyone about what I am doing wrong? Thanks! Thank you! This post was a godsend. My walking foot came in a plastic package with zero instructions and i had no idea that the lever needed to rest atop the needle screw. Duh! Now it is working like a dream. Another thank you Liesl. Ditto to all of the above. Much appreciated the link to Janome re the guide. Now I understand! Wonderful!! Have broken several needles, left marks on my needle cover, and still had no success. I called the shop and was told to look on the original packing. Obviously they didn't realize that there are no instructions. Thanks for providing me with the help needed to find success!! The part about the lever was key for me, could just not work it out. Thank you so much ! I bought this foot long time ago and wanted to try yesterday for the first time. I was completely puzzled and thought I got the wrong foot. You don't know how handy these instructions are, you're a star! I was about to give up on attaching the walking foot and found your wonderful blog/tutorial. Your instructions and pictures saved the day! Thank you so much! Thank you so much for your tutorial, helped me out a lot, like a lot of the other people have said on here, I was looking at my foot then the machine, couldn't quite fiqure it out on my own. So thank you again! I can only add my name to the list of grateful people. I was more than cheesed off because I thought I had bought the wrong attachment for my machine and had damaged the packaging just getting it out so there was no possibility of returning it! The instructions I received were totally inadequate. You are brilliant! I was dreading having to phone customer service (again)and try to explain what was going wrong. Why do Janome not include instructions? Someone is sure to have posted some instructions on the web, I thought and then I found you. I wonder tho, should I adjust my presser foot tension? Hi Kath - I have never done anything except pop the foot on and start sewing (but that might be more about my laziness!). The only thing I have done periodically is re-tightened the screw as the vibrations from the machine seem to loosen it a bit. Good luck! Thank you so much, you solved my problems had been too scared to open the packet. Now foot is on with no problems. Hooray, thank you for these instructions. I was staring at my new walking foot wondering how I would ever get to use it, haha! Now off to quilt! Three years later, and these instructions are still helpful. Thanks! Thank you for those instructions. I've just purchased a walking foot for my daughters new Janome. She is doing a quilt for a Year 11 project. We were told to purchase a walking foot, which came with no instructions, and a darning foot. Have you got any tips on using these both together? I love you! haha! After many attempts to attach my walking foot I put it back in the package. I was determined today was the day! Thank you for the instructions! Enjoy your walking foot Judy! My tension underneath seams very loose any suggestions? 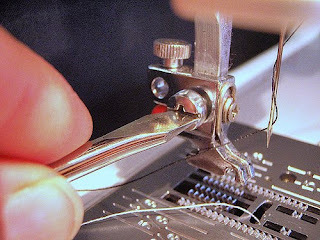 After asking my husband nicely if he could help fit the Walking Foot for the first time on my Janome, there was much cursing from him as how fiddly it was. Then we found your web page. You are now his BEST EVER friend!!! Hi, I bought a Janome walking foot and, thanks to your tutorial, fitted it easily first time. However, the top and bottom teeth only match up on the left side of the foot, on the right side they do not (the walking foot has a few mm more between the top and bottom teeth). Is this normal? Thanks! yet another very grateful reader! My sewing machine shop recommended this when I bought my new machine, as I make bags etc with Harris Tweed. Now you have explained how to use it it is great!! My walking foot had no instructions with it when I purchased it. I thought, "This can't be too difficult." Wrong! No instructions on the Janome website, either. Thank you so much for posting such a detailed description. Kudos to your photographer, too. Thank you so much for posting this. I have had a Janome with the optional accessory set for over 10 years and never used anything in it. I am really looking forward to using the walking foot. Thank goodness I found your tutorial! A thousands thanks for taking the time to teach. Thank you for this wonderful tutorial! The secret phrase to "rest the lever on the needle clamp". It's too bad Janome doesn't put instructions on their accessories. On the other hand -- thank goodness for people like you who take the time to post tutorials!!! Glad you mentioned the quilting bar along with the walking foot. My walking foot doesn't have a convenient "hole" to secure the steel rod which will allow me to use it as a sewing guide. Instead, it has a narrow formation at the back across the width that doesn't hold the steel rod. The two parts don't even seem to go together. Can you advise me how to use this type of walking foot with an L-bar to secure it enough to use it? I will be so amazed to know that you've figured this out. You're a genius. Thanks. Thank you so much for posting this, I just bought a walking foot for my Janome and had absolutely NO idea what to do with it, it did not come with any instructions whatsoever, Mysterious little bugger, it is! Ican't align my shank hole up with the walking foot hole. The shank hole is too low. 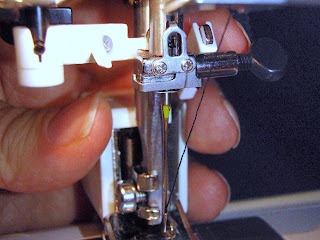 Is there walking feet for low and high shanks JAnome sewing machines? Six years later and your instructions are still making people happy! Thank you so much. Like so many others, I fiddled and frowned and cursed and cried in frustration trying to figure out how to attach the walking foot. Janome really should be paying you. Perfect! Remove the holder thingy!! So easy when you know this bit!! So helpful to have found these instructions! Thank you! Thank you!! This was far and away the best tutorial I found on this tricky matter. If you are still reading and responding to comments, thanks so much for this post. I really, really agree with all these folks who've posted that you're the ONLY source for directions for the walking foot. A thousand thank-yous! Could you please explain, if you happen to know, what the two different feet are for, that come with the walking foot? One has a narrow slow in the front and one has a wide one. Is one for a straight stitch and one for zig zag?